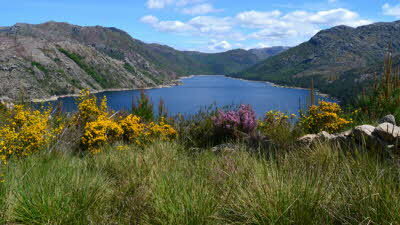 Set in the Peneda-Gerês National Park in northern Portugal, this peaceful, unique site provides unlimited options to enjoy the natural surroundings, unspoilt countryside and wildlife surrounding the site. Enjoy walking, climbing, cycling or just taking in the incredible mountain views. All facilities are maintained to a high standard, and a superb restaurant offers a full menu of local cuisine. Water-based activities range from an on-site swimming pool to fishing and canoeing nearby. Visitors can enjoy the great outdoors on the beautiful walking trails with their views of mountains and stunning lakes, while those wanting to venture further afield can cross the border into Spain and explore the port town of Vigo. Campo do Geres, National Park Pena-da-Geres, Roman Road Museums, Braga, Rio Homen, Lake Barragen Vilarinho da Furna, Guided Hikes/trails, Cycling, Horse riding, Kayaking, Canoeing. Supermarket is less than 1km away. We stayed here for one night en route from the Porto area to Spain at the end of February. The receptionist was very helpful and spoke excellent English. The pitches are hard standing and level. Only the main facilities block was open but this is a very new, excellently equipped, spotlessly clean facility. The disabled shower and toilet were also first class. The receptionist did offer to open the mini market for us and get us bread for the following day. The restaurant is only open at week ends in winter. The area is ideal for walkers and very scenic. On the map I had spotted a road that runs north east just a couple of hundred metres from the camp entrance towards the Spanish border which cuts about twenty kilometres off the recommended route. I asked the receptionist if it was usable. The reply was that with a small unit like ours (5ms long) and at this time of year, it should be OK. It was but it is only a badly potholed dirt track with a very steep ascent for the last 300 metres onto the main road. If in the area again we would probably stay here longer. 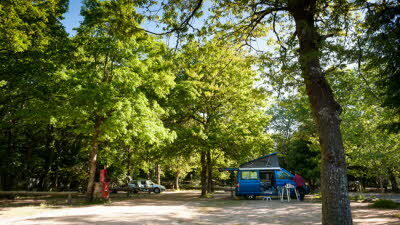 We stayed here with our 8m caravan. We made the mistake of driving to the site, following the GPS route using the OR312 across the border from Spain into Portugal, I would not recommend this route even with a smaller caravan, it was VERY tight on the mountain twisties! The best route from Spain would be on the N103/N304. There is a mix of serviced and non serviced pitches which are under trees in the main and there is very little grass, save for around the pool area. The toilet and shower amenity buildings are spread around the site and were good. 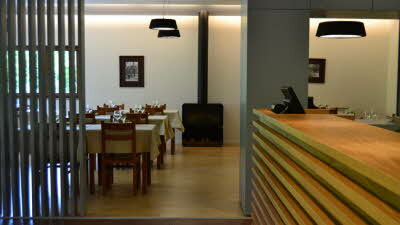 The reception, bar, restaurant and shop were all situated in a group of modern well kept buildings. Prices of meals and drinks were reasonable. There was no organised entertainment during our stay. Quiet and well maintained site in a desirable setting in the hills of Northeren Portugal. Such a contrast to the Algarve where we ended up. The location was excellent for folks who are keen on walking and exploring the countryside. Quaint and unhurried . Almost like stepping back in time. I would suggest that the rural roads are unsuitable for large outfits and towing a caravan here could be challenging. However, back to the site. Very quiet in September, when we visited and much in the shade for part of the time. Restaurant was well versed in local cuisine. Staff were pleasant and helpful. Not fluent in English but patient and keen to please. Toilets were pristine and showers were hot but not the wash hand basins.